PESHAWAR: Chitral defeated rivals Gilgit in a hard-hitting finale on Monday to conclude the three-day-long Shandur Polo Festival, which was being played at the highest polo ground in the world. Despite inducting new players this year, Gilgit could not beat defending champions Chitral, who retained the title with a 10-5 score for the fourth time in a row. Inspector General of Frontier Corps Major-General Waseem Ashraf was the chief guest on the occasion. Deputy Speaker Gilgit-Baltistan Assembly Jaffar Ullah, Minister for Tourism Gilgit-Baltistan Fida Ullah, Ambassadors of various countries in Pakistan, a good number of local and foreign tourists, former polo players and officials of Tourism Corporation Khyber-Pakhtunkhwa were also present and witnessed the final. Strict security measures were taken in and around the Polo festival by the Chitral scouts and police for the smooth conduct of the traditional event. A large number of foreign and domestic tourists and visitors experienced the battle between true warriors on the world’s highest polo ground in Shandur. 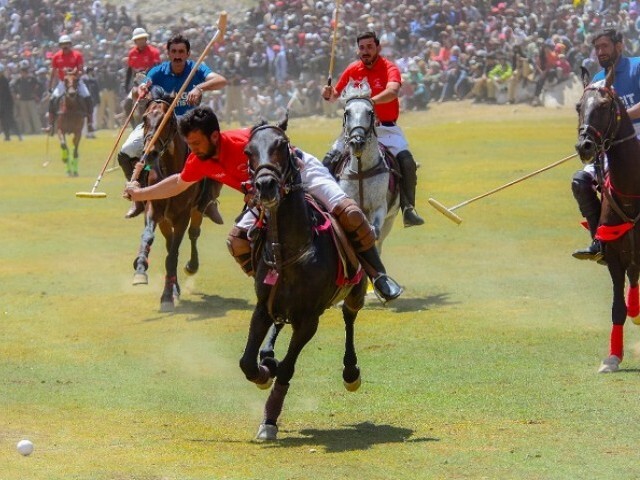 The polo teams of Chitral, Gilgit, Laspur and Ghizer participated in the ‘game of kings’. A true representation of local cultures including music and performing art was also displayed. A tent village had been set up for providing boarding and lodging facilities to both foreign and domestic tourists. The polo ground was renovated while there were numbers of other programs to showcase work of local artists and cultural nights during the festival. The district government of Chitral, police, army and other stakeholders had assured full cooperation in making the event a success. The tourists also enjoyed cultural and music evenings while fireworks was arranged at night time. Paragliding and traditional dances of Chitral and Gilgit-Baltistan were also performed alongside the polo event. The paratroopers of SSG also have a free-fall from the 10,000 feet besides demonstration of paragliding which enthralled spectators. At the end of the final, Maj-Gen Waseem Ashraf gave away trophies and cash prizes to the winners and runners-up team. The winner was awarded Rs100,000 and the runners-up Rs90,000. With additional input from APP.